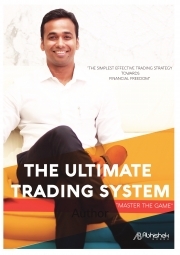 Description of "The Ultimate Trading System"
This Ebook tells you how I started trading, how I got into trading equities from being a stock broker. This shows you how a simple strategy can help you earn in stock market consistently. The new e-book reveals my trading strategy that I have been using for the past 10 years successfully. It has been tested for the past decade. Read this book carefully because I have played this game and I will show you how to play, where to look and how to keep a good score. I have filtered what you should be looking for and will show you a simple and clear and effective way of trading. Always remember TIPS = SPIT read backwards and we all know what happens if you spit and are on the wrong side of the wind. I am a trader who gave up stock broking for a better opportunity to earn from trading stocks. My education includes a masters degree in finance from the reputed university,UK. My determination to earn from trading equities has encouraged me to develop a strategy that I am ready to share with the world. Hands on Object Oriented Programming 1000 MCQ by Harry Chaudhary. Reviews of "The Ultimate Trading System"